As a renovator the 3-x-3 Post-it note can restore a home better than paint and new siding. It can repair more things than duct tape. As a daily supplement — given (not taken) daily like a multivitamin — it fosters growth in the relationships of spouses, lovers, parents and their children; it can nourish souls; and, in my case, correct poor vision. Story goes like this: One day a few years ago I told my wife, “I love you.” Nothing unusual there. During 15 years of marriage (20 now) I’d said those three words to her 5,475 times (365 x 15 minus a dozen or so arguments each year offset by extra sentiments added like sweetener each anniversary, birthday and Valentine’s). This time, however, my wife’s response was unusual. Maybe we’d been arguing and/or drifting into our separate work and projects. I honestly don’t recall. “Why?” she responded, hugging me. Her question wasn’t rhetorical. There were many reasons I loved her, but I couldn’t recall the last time I’d bothered to articulate many or any of them. Put on the spot, I waved her off, used a question to fend off the question. I’m an early riser, always first in the house. 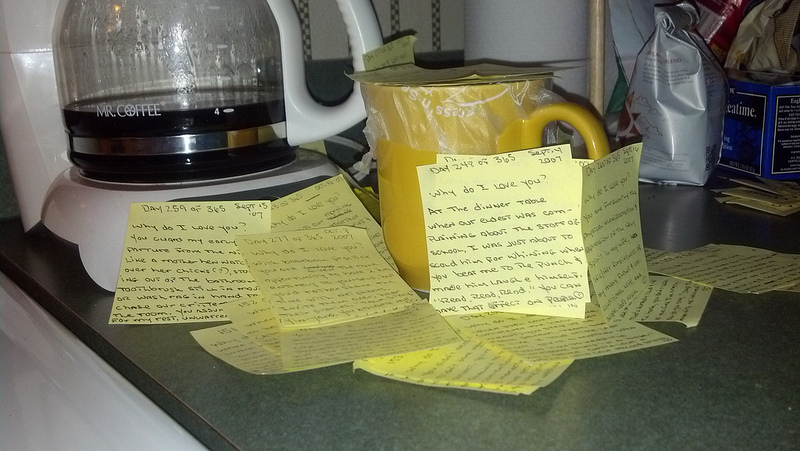 The next morning, before pouring my second mug of coffee, I repeated her question by writing it on a yellow Post-it note. I then answered it in a sentence or two. In order to tell you exactly what I wrote (assuming I would) I’d have to dig through an unsorted, sticky pile of 365 Post-its. But my response isn’t the point. The next morning I repeated and answered her question again. I scribbled “Day 2 of 365” on top of the Post-it, pretty much committing myself to a year of responses. No big deal. Restricting my thoughts/observations/praise to a 3-by-3 inch yellow square meant I had to be succinct. Each note consumed less than a minute. By the time I wrote Day 7 of 365 my gratitude had begun sounding like platitudes. “I love you because you’re a good mother to our two sons” is nice, but trite. To keep the notes fresh I had to glean new material each day. I had to keep my eyes peeled for good anecdotes and things to praise. That is, instead of reacting to petty things that irritate every long-term relationship, I began noticing the simple things that sustain them. For example, the way she spent twenty minutes each day watering our baby pear tree. I’d never even known. Or the way she was the first to volunteer to keep stats for my Little League team when the regular scorekeeper was absent. Winter turned to spring and spring to summer before I realized that my wife and I weren’t arguing as often. The habit of recording her qualities had made my gripes seem trivial. In return, my daily appreciations had encouraged her to give me more slack whenever I screwed up. It was a win-win. A year later I was telling this story to my first book editor (Sheryl Fullerton of Wiley) in a crowded restaurant in Half Moon Bay, California. Before I could finish it I felt someone standing over my shoulder, like a waiter or waitress. I looked up and it was a young man, a customer from a nearby table. When he spoke his voice trembled. Tears pooled in his eyes. He explained that he was semi-estranged from his parents, and, while listening to me describe my Post-it therapy, he’d realized how much he had failed to appreciate his mother and father. Like most parents, his were selfless but imperfect. He now wished that he had focused on the former rather than the latter. Me too, again, and before it’s too late. But my regret tracks in the opposite direction of his. A loved one told me recently that I can be too critical of my sons. They are now teenagers, with all of the computers and video games and iPods that come with that age. Screens, screens, screens, it seems I am always screaming about screens. That’s not likely to change. However, I need to focus on the larger picture. I know this. I just forget. So on New Years Day I filled out a Post-it appreciation for each son. On one, I mentioned how much I love that he is patient and tender with our dog, Kona. On the other, I mentioned how much I enjoyed his thought-provoking insights on politics and war. Both of my kids have huge hearts and engaging minds. But those descriptions are vague, trite. If I hope to get a year’s worth of material, I need to be specific. I need anecdotes and things to praise. I need an open mind and eyes that stay open. I need to pay better attention. I’ve always liked Apostle Paul’s advice in First Thessalonians to “pray without ceasing.” I’ve never understood that to mean that we should go around with our heads bowed and eyes closed. Just the opposite. We should always be aware and alert to the miracles and blessings in our life. To my sons. So, wish me luck. It’s Week 1 of 52 in 2013. Please check out my upcoming book/film tour and Indiegogo campaign HERE.